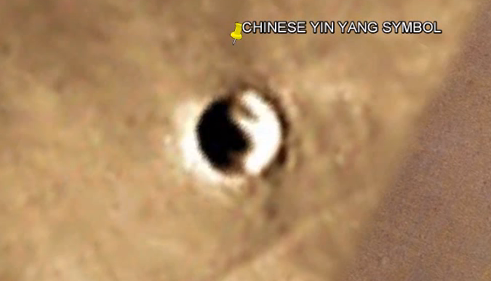 UFO SIGHTINGS DAILY: Yin-Yang Symbol Found On Surface Of Mars In Google Map, March 2016, Video, UFO Sighting News. Yin-Yang Symbol Found On Surface Of Mars In Google Map, March 2016, Video, UFO Sighting News. I like this and why? Because its an alien symbol that ties into cultures here on Earth. This is more evidence that some of the people of Mars did immigrate to Earth long ago. I have found a similar Yin-yang symbol on Mercury a few years ago. This one on Mars increases the evidence that some of the Asian culture came from Mars. Extraordinary find by researcher Marcelo Irazusta of Youtube. The Argentine RESEARCHER MARCELO IRAZUSTA surprises us once more with this incredible discovery. CHINESE SYMBOL YIN YANG.